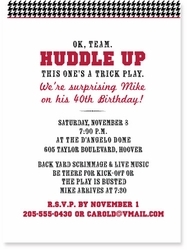 Description: Fun for your favorite football fall, our Huddle Up birthday invitation scores big with fans young and old. This design can be customized with your team colors or patterns as available! Just choose "Customize" in the dropdown and leave us your request in the Comments section at checkout.